Bakes from my kitchen ...: Ben 10 for the nephew ..
My nephew (hubby's side) turns 3 today .. exactly 1 month after my youngest birthday. 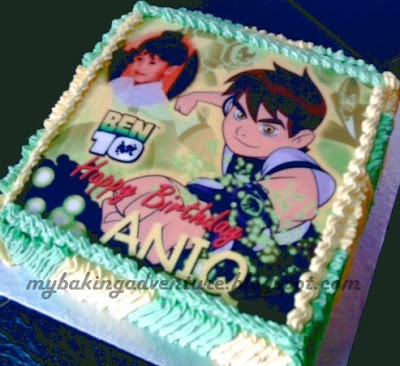 His mom requested for a Ben-10 cake for her eldest for a small celebration. How can I turn it down? With such short notice, I decided to do a cake with edible image with his cute little face on it. I made a simple chocolate sponge with chocolate fudge fillings. Then covered it with whipped cream. Icing sheet or frosting sheets to some is very easy to use. However, the normal problem most people will have is bubbles. Make sure that your cake is frosted well. Also, brush the back of the sheet with a little oil to prevent air from escaping to the surface of the frosting and causing bubbles to appear (I got this tip from the internet). If bubbles still appear, you can smoothen it out gently with your fingertips or poke a hole with a small needle and then tap it gently with your finger. did you still print the icing image yourself? Take order?